Home Uncategorized GOV OKEZIE IKPEAZU COMMENDS CKN NEWS, ACCEPTS INVITE TO 1st ANNUAL LECTURE. GOV OKEZIE IKPEAZU COMMENDS CKN NEWS, ACCEPTS INVITE TO 1st ANNUAL LECTURE. 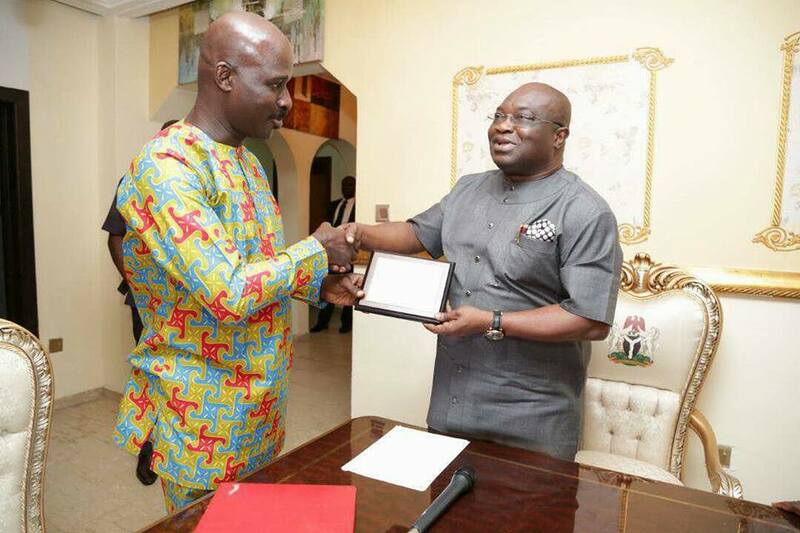 Abia State Governor, Dr Okezie Ikpeazu has commended the Editorial Board of Nigerias’ foremost Online Media Platform CKN NEWS for its efforts at bringing credibility to online publications practice in Nigeria. He made this assertion in Umuahia at the weekend when he received in audience, members of the Editorial Board of CKN News who were at the State House on a courtesy visit. Chris Kehinde Nwandu presenting the CKN News Governor of the Year Award for Infrastructural Development And Security 2015 to the Governor; HE Okezie Ikpeazu. Dr Okezie Ikpeazu admonished online media practitioners and bloggers to see themselves as major stakeholders in the Nigerian dream. “You should always strive to be above board in whatever you do. Avoid sensationalism in your reportage .Think about your country in your write up and most importantly, remain on the path of truth always irrespective of whose ox is gored,the Governor opined . He commended the CKN News platform for showing exemplary professionalism in its reportage since it was established eight years ago. “Yours has become a very reliable platform, you exude a lot of professionalism in discharging your duties as Journalists, I can only but wish you the best of luck in all you do. In his own remark, the Publisher /Editor In Chief of CKN News, Mr Chris Kehinde Nwandu (CKN) who is also the President of Guild Of Professional Bloggers Of Nigeria (GPBN) said his team was in Umuahia to formally invite the governor to CKN News 1st Annual Lecture scheduled to hold on Tuesday 13th June 2017 at Renaissance Hotel, 38 Isaac John Street,GRA Ikeja Lagos starting from 11am. The theme of the lecture according to him is :The Role Of Social Media To The Socio Economic And Political Development Of Nigeria”. Mr Nwandu told the Governor that it will be a privilege to have him Chair the maiden edition of the CKN News Annual lecture. He also used the opportunity to congratulate the governor on his recent Supreme Court victory. According to him, the Annual Lecture will be delivered by the Minister of Transportation; Chibuike Rotimi Amaechi will be the Guest Speaker. The Guest of Honor is Dr Boboye Oyeyemi, Corps Marshal of FRSC. Prof Umar Danbatta, the EVC/CEO of Nigerian Communications Commission will give the keynote address, while Governor Akinwunmi Ambode of Lagos will be the Chief host. The highlight of the visit was the presentation of the CKN News Governor of the Year Award for Infrastructural Development And security 2015.